London’s Natural History Museum opened on the 18th of April 1881. It was built by the architect Alfred Waterhouse from Manchester and he planned it in the style of the Neoromanik. 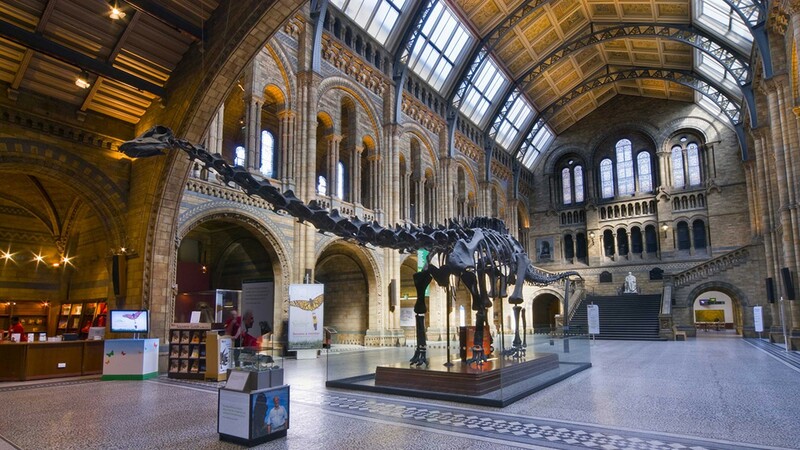 In the museum, there are over 70 million different objects, beneath many dinosaur skeletons, fossils and some samples of flora and fauna. There are many different galleries, the Life Galleries, the Earth Galleries, the Darwin Centre and the Wildlife Garden. You will see the biggest meteorite collection of the world and in the Earth Galleries you can experience the history of the Earth. The museum is always opened from 10am till 5:50pm, the entry is free and it’s located in the Cromwell road. Why we absolutely have to go there! We absolutely have to go there, because it is an exciting and interesting museum. You can discover something, learn something and try things out on your own. There are so many different objects, rooms and galleries, that there is something for everyone I think. I guess, that we would have a lot of fun.